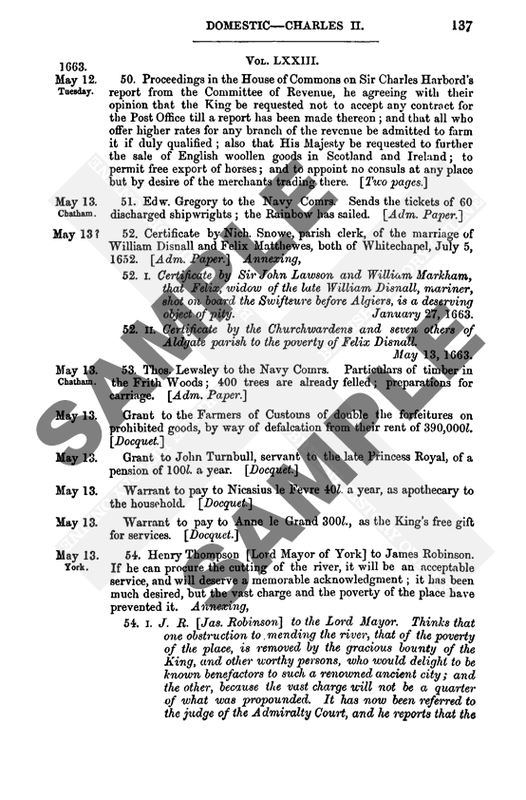 Calendar of State Papers Foreign: Elizabeth, Volume 14, 1579-1580. Originally published by His Majesty's Stationery Office, London, 1904. 400. The DUKE OF ANJOU to COBHAM. 401. A REPORT ON PAPISTS. The Earl of Westmorland, riding from Paris to Rheims, and lodging at the Swan there, sent for Dr Webbe and Mr Bayllye to sup with him. At supper, Dr Webbe demanded of the earl to what end the King of Spain had prepared his great army. To whom the earl answered—'and took bread and did eat it'—that the army was prepared for England and Ireland ; for which cause he with other Englishmen that had the King's pension were sent for into Spain. Also he said that the King was staying only for 35,000 Italians from Italy ; but he wished that Portugal had been 'on a fire' so that the King had not meddled with it, for had not that fallen out so unluckily, he would have seen England in short time, and Dr Saunders have lacked no help in Ireland. Also he would often say 'and if' he had been as malicious as she (meaning the Queen) he might have been in his own ere this time. Also he said he would never come into England but to the end it should be Catholic ; and on that condition he would willingly lose his life in the last battle to seal up the peace withal. Moreover he said they might all curse the Earl of Leicester, for he being one of the chief of their conspiracy craved pardon and disclosed all their 'pretence' ; so that their company durst not come in to them, but left him and the Earl of Northumberland in the lurch. Besides he said that the Earl of Leicester sent one over to kill him and Lord Copley, but he hoped to see the day to meet him in the field, when he may be revenged on him and lend him a lance in his breast for his labour. 1. Wilson, about London or at Mr Gage's. 3. Short, otherwise Stalie, in Holborn. 5. Nicolson, in London, or at Mr Bennett's in Essex. 6. Appleton, in Essex at my lady Pawlett's at Boxley. 7. Vivian, at Mr Martyn's of Long Melford in Suffolk. 8. Ford, otherwise Harwood, at the Yeats' of Lyford in Berkshire. 9. Stamp, about Sir George Pecham's or my lady Tregonion's in Hampshire, or very near thereabout. 11. Corry, otherwise Pawle, in Hampshire with Mr Carrell. 12. Norris, with Mr Gylbarte, and Mr Garves Parpoint, and Mr Gifford. 15. Martyn Aray, about Hampshire. 16. Mr Fytton, dwelling about Windsor, has one who goes in a blue coat and is named in the house nothing but Richard ; his other name I know not. 17. Johnson, lying at the 'Spittle' with Mr Hare ; and this Hare is he who conveys over to Rheims and Douay at least £400 every year. 402. DR. RUY LOPEZ to LEICESTER. Being here in Walsingham's house, I thought it well to let you know what the ambassador asks of her Majesty, beseeching to be a means with her for her consent, seeing that it is a matter so necessary for the defence of our realm of Portugal. As the King Don Antonio says, it will ever be devoted with all its might to the service of this realm against all others, and there will remain a league which will never be broken. Wherefore I pray you herein to show yourself a true Portuguese, and I promise to be not only, as I am, your doctor and servant, but your slave. The work in hand is to make that realm free and this secure. The ambassador begs that you will arrange for the Queen to see him (if it were secretly with me alone), that he may tell her what he thinks.— Barn Elms, 19 Aug. 1580. These are the things that the King of Portugal asks of the Queen of England. 1. Twelve ships well equipped with artillery, men and munitions. 2. Two thousand harquebusiers with their officers, who will all be paid in Portugal from the day of leaving England till their return. 3. As much bronze ordnance of all sorts as the Queen may be willing to direct ; the realm being in great need of it. 4. A thousand quintals of gunpowder. 403. COBHAM to the SECRETARIES. 404. THOMAS COTTON to BURGHLEY. 405. COBHAM to the SECRETARIES. 411. COBHAM to the SECRETARIES. 412. "Representations to the King and Queen Mother on the State of Portugal." Your Majesties ought not to abandon your intention of aiding the King of Portugal for the news of the capture of Lisbon ; rather you should use more diligence, that the realm be not lost. Nor need you give it up from fear lest Portugal be lost already. For Lisbon is not all the kingdom, nor the key of it ; only a town very difficult to hold, and in itself of no defensive strength. If the King of Spain wishes to keep it, his whole army must remain there inactive. It has no walls or fort where he could leave a garrison to keep it in subjection, nor is it possible to erect one owing to the inconvenience of the situation. It will take 20,000 men to guard it, and he has not more than 15,000 all told. If the King of Portugal has had some of his people routed as they say, it is not all the kingdom ; only those whom he could hastily get together in the city, not having time to do more. While the King of Spain's army is occupied in guarding Lisbon, the King of Portugal will be at the other towns which remain to him, which are many and strong. Here he will collect his forces from all his provinces, and with the succours which you will send him, will easily retake Lisbon and drive the Spaniards from his country. If the King of Portugal had been slain, there would have been some reason for not sending the promised succours, as things would be desperate (déplorécs) ; but as he is in one of his strongest towns, and has plenty of people who take his part yet upright, and has all the towns and ports at his devotion, except Lisbon, there is good appearance of resources, if the succours are hastened, and he gives the King of Spain no leisure to establish himself ; whose violent proceeding is in truth formidable to many, and disagreeable to all. If they can see any appearance of succour, they will take fresh courage. Guyenne, Normandy and other provinces, even Paris, have ere now been occupied by the English, and the King of France called in mockery the King of Bourges. Yet in course of time the French re-established their true King and drove out the English, who nevertheless seemed to have a firm footing. Even if all Portugal had been seized by Spain, and the King slain, neither of which events is likely to happen for some time, your Majesties ought, for the benefit of this Crown, and to prevent the King of Spain from becoming so great, to give M. Strozzi the means to go at least to the Azores and the Portuguese Indies in order to take possession of them and defend them against the King of Spain while he is occupied in this new conquest, as a counterpoise to so great a power ; otherwise, if leisure is left him to seize them, he will care little for France, and may do it much harm. If the King of Portugal, being left without the support that you have promised him, finds himself unable to maintain his position, he will in desperation go off to Barbary and hand over his strongholds there to the Moors, whence they will easily be able to pass into Spain, to the shame of France and ruin of Christendom. Another consideration which should induce you more boldly to support the King of Portugal is that M. Strozzi is the person employed in the matter. Being a foreigner, and known to be a courageous and enterprising man, you will be able at your ease to disavow him if the fear of an enterprise against the King of Spain chills your ardour ; though his powers are not so great as we make them out. Or you might let it be undertaken in his own name by Monseigneur, as an interested party, having been offered by you to the Estates of Portugal to be their King ; to which the most part, nay the whole, of the realm was well inclined, but for their affection and duty towards their native prince, Don Antonio. And provided you assure M. Strozzi secretly that you approve his undertaking it, and secretly provide him with the means (for better concealment fitting him out once for all) he will also be content that you should thenceforward make such outward show of disapproval as you please. In this way you will discharge your promise, will succour a neighbour and friend, binding him and his realm for ever to you and your posterity, without any need to fear vengeance on the part of the King of Spain, both because he will ostensibly have no just cause, and because this course of action will give him enough to do to attend to his own affairs. Moreover, if anyone thinks that the King of Spain is not aware of Don Francisco Baretti's visit to the Court, and of the hopes held out to him, he is much mistaken. He has too many friends in France, even at Court, to be ignorant of it ; and notably of the fact that Strozzi accompanied him to Nantes, had him well entertained by the way at Chenonceau, by order of the Queen, got him a ship, supplied him with all the men he could, kept back a good number of vessels in virtue of the King's commission, and lastly obtained money from André Ruys, who is a Spaniard and must have told the King his master. So that it is a double mistake to believe that if nothing further is done, the King of Spain will abate aught of any illwill he may have conceived against you ; for he will on the contrary grow more insolent, when he sees that fear is the only cause of holding back. And inasmuch as he will recognise that it has seized us at the report of a single piece of good fortune which he has had in Portugal, what will it be when he has got everything and the Indies, and reduced the Low Countries to his obedience, which will be easy for him if he is let do it ; aye, and to take England afterwards? In short, your Majesties may take it as certain that he will not lack pretexts for making war on you as soon as he sees it convenient The more you temporise with him, the more you further it ; and you need not respect him so much, since for his part he has not respected the agreement of '59, when the King of Portugal was called by the late King Henry a brother in arms and allied with France, nor had regard to your Majesty's rights and claims when you had been admitted to assert them. Of which he was not ignorant ; but as a disturber of the peace of all Christendom he entered by force of arms into Portugal, to which you have much more claim (action) than he. Your Majesties ought not to omit to send succour there, nor fear that it may be unable to enter Portugal, even though Lisbon be taken ; inasmuch as on this side Lisbon the King still has several good ports, as Tosquia, Porto, la Perdriguera, Mandego, Viana, Huero, Camigna, and others, where a landing may be made. If M. Strozzi thinks it better not to enter the kingdom in arms, he might keep with his force 50 miles off the coast of Portugal, and send a small vessel under cover of selling corn, with some experienced men in her to see the state of affairs ; by whose report his proceeding should be guided. If he should find from them that it would be better he should not land, he can go to the Azores where he will be well received, and strengthen himself there. He will stop the King of Spain's traffic with the Indies, and secure Brazil, Guinea, Cape Verde, San Tome, Camigna, and all the Indies, the islands lying on the route to those places. I beg your Majesties not to think I am speaking for any harm the Spaniards have ever done me, nor for any good I have had or hope to have from the Portuguese ; but solely from my affection to your service, and the loyalty which I owe you.